Awesome and incredible Star Wars paper giclee print! Hand-numbered artwork signed by the artist! Is there anything better than sitting and relaxing in the swamps of Dagobah upon the nice log of a fallen tree? The great Jedi Master Yoda doesn't think so. And if it's good enough for Yoda, then it's darn well good enough for you, con tarn it! 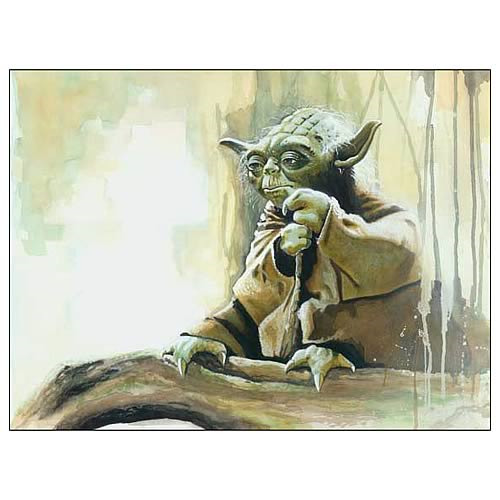 How do you think Yoda got to be such an awesome and powerful Jedi Master in the first place, hmmm? Meditation, it was. Or so Yoda would tell you if he were still here, may he rest in peace. Just follow Yoda's example and you won't be headed in the wrong direction. This 19-inches wide x 13-inches tall paper giclee print would look incredible hung up on your wall.